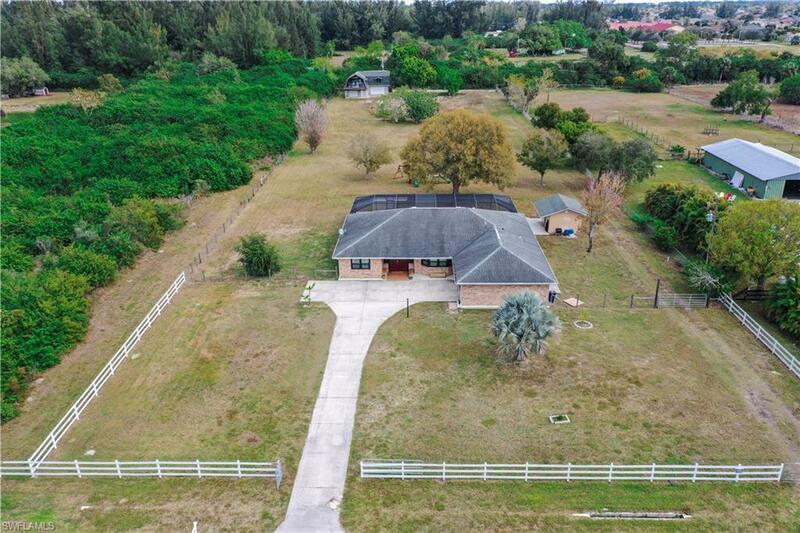 Fabulous 2.75 Acre property centrally located just off Pine Island Road in Cape Coral. The entire property is fenced and has been recently updated, bring your horses! Huge pool with extra large screened lanai is great for entertaining and the pool safety fence is also included. Great layout with split floor plan, guests on one side, master on the other, and fabulous views of the pool and property. There is a small pond at the rear of the property by the outbuilding. The outbuilding is currently used for storage, but the 2nd floor could be finished and used for a mother-in law suite or a home office. The updated kitchen features a wonderful breakfast nook that could easily seat 10 people and has great views of the pool and patio area. The huge master suite has a newly updated bathroom with double vanities and a good sized walk-in closet and the guest bathroom was updated as well. Mixture of hurricane windows and shutters, and NO flood insurance is required. Please come see this unique property for yourself. HOME WARRANTY INCLUDED!